Like it or not, the Holidays are on the way and that means it is TIME TO GIVE GIFTS. And the *best* gifts are the ones from the heart and the best way to show your recipient your gift is from the heart is to give a Handmade Gift. Here is an AWESOME handmade gift -- sugared almonds made all by yourself, in the crockpot slow cooker. 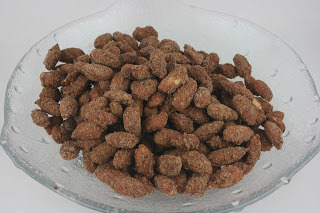 Last week I posted a Wasabi Roasted Almonds recipe, and I got a bunch of emails asking for Cinnamon Sugared almonds. Use a 4-quart slow cooker. Spray the stoneware well with cooking spray. In a mixing bowl, combine sugar, cinnamon, and salt. In a larger mixing bowl, whisk together the egg white and vanilla extract. Pour the almonds into this bowl and stir well to coat. Add your cinnamon mixture to the top of the nuts and toss with spoons to fully coat (too many nuts to do the plastic bag toss---you'd have to do batches). 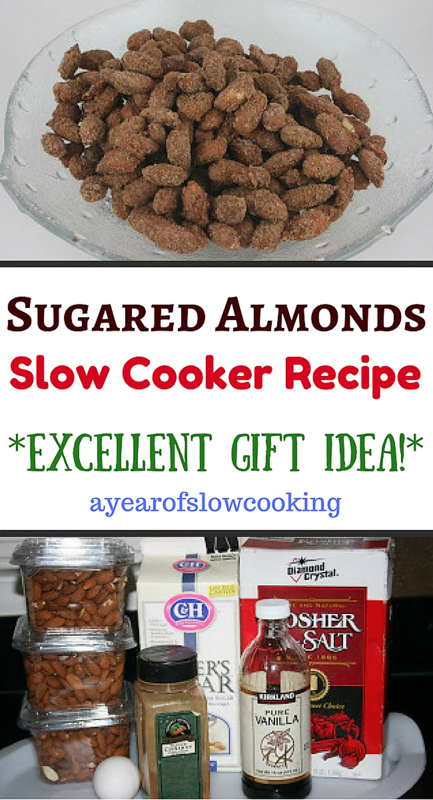 Put the almonds into the slow cooker and cover. Cook on high for 2 hours, stirring every 20-30 minutes or so to keep the almonds on the side of the crock from getting too crispy. When the nuts are all hot and toasty, let them cool fully on a length of foil or parchment paper. 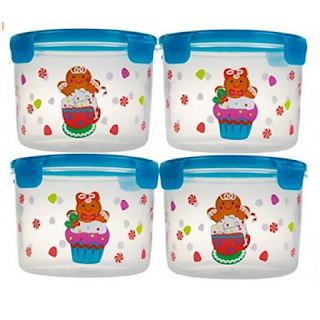 When fully cool, store in an air-tight container. I never had the chance to store my almonds in an air-tight container. Adam and the kids kept taste-testing them, and my dad came over to borrow a drill (or some tool, I wasn't really paying attention, and this was a while ago) and I left the house to go to Trader Joe's. When I got back, there were about 6 nuts left and cinnamon and sugar was strewn all over the countertop. Great recipes - I actually made these yesterday using my own (similar) recipe - I avoid sugar so used an equal amount of granulated Splenda instead. This is great! I see that the year of slow cooking must have been great! I just found your blog, and I have always wanted to try using my slow cooker more! If ALL your recipes were Gluten Free, I might just do every recipe you do....but maybe I can find a GF version....? Anyway, great blog! I look forward to looking through all your recipes! How do I "follow" your blog? There is no link on your home page. I wonder if you could replace the sugar with brown sugar? katieburst, my almost-6-year-old has celiac, and we keep our home gluten free. everything on the site and in the books is gf. does "follow" mean subscribe? there's a link at the top of the page under the header to subscribe through feedburner, if you'd like. babymama, sure! I don't see why not. Amy, great idea. I haven't played much with splenda, but keeping hearing great things. Sounds dee-lish! I don't know how I missed the wasabi recipe, but I'm going to look for it now. Yummy! I copied your home URL and "added" it on my blogger dashboard to "follow" you. I also have you linked to my blogroll AND I listed you to a linky on a tab at the top of my homepage....your site is a valuable resource to the GF community EVERYWHERE! BTW, my daughter also has Type 1 Diabetes.....I may a Splenda version -- not sure yet...she can have sugar without any problem as long as we give her the insulin her body needs to break it down into a fuel source. i love buying these at the store and had no idea i could make them. just put a batch in about an hour ago and now the house smells so yummy! we have a 13 hr drive tomorrow so we look forward to this great snack of protein and sugar to keep us going. thank you, thank you, thank you! I love the christmas gift idea. We are trying to do all homemade gifts this year and those would be great! Is 3 1/4 cups of almonds about a pound? Can't wait to try these, thanks for sharing the recipe. These look great! I love the idea of trying Splenda or brown sugar too. I like it when there are easy ways to vary a recipe and keep things interesting. I like almonds but I LOVE pecans - I'll bet pecans would be great too, especially if you use brown sugar. It would remind me of the pecan topping we put on our sweet potato casserole at Thanksgiving! Just want to say how much I'm enjoying these posts, Steph! I really missed the daily posts after "the year" ended. Now I'm revisiting many of those recipes and trying more of them, too! Try pumpkin pie spice instead of cinnamon! my daughter is having her tonsils out in the AM and I will be stuck in the house all week and was planning on trying out some new recipes. This one is now at the tops of my list, I LOVE ALMONDS!! OMGoshiness ...yes, these are Christmas presents for the neighbors (if i don't eat them all first). thank you! I am loving Crocktober, what a great idea! Oh wow. This is going onto the Christams gift list. They look amazingly yummy! I want to try this recipe... sounds good, and this would be great for gift giving. Oh, I love these almonds. I never felt like making them before, but in the crockpot ... genius! I made these this weekend!! They are WAY too good (and easy!) I keep trying to think of reasons to make some more. Yummy! I made these this weekend and they were so delicious that I can't believe you shared the recipe! These would be a great holiday/hostess gift in a cute jar. My hubby and I will no longer go to the mall or other stores that have these and pay $6 for about 15 nuts. It took us about $13 to make them at home, and we made 1.5 batches. Thank you for sharing the recipe! I made these today with the kids on the first day of Fall Break. I used Splenda due to sugar issues, and I swear, these are like crack. A HUGE hit in our house tonight!! I wasn't too sure about adding the cinnamon, but I gave it a shot. My hubby and kids LOVED them!! Thanks again for another great recipe! I am sitting here trying to NOT eat all of the almonds from the batch I made today and am not having much success. The sugared almondsy are amazing! I used brown sugar and added a half-teaspoon of ground cloves. I wound up with a bout a cup of crunchy spiced brown sugar crumbles (I was perhaps a wee bit generous with the brown sugar, yanno?) .... which will end up as a topping on toast (my son's idea) and/or coffee cake. I've made these a number of times since finding this recipe, they are SOOOOOO good, hubby and I just keep eating them! And have started making them and vacuum sealing for Christmas gifts. I also tried a batch replacing the cinnamon with cocoa. The turned out GREAT as well. They kind of taste like cocoa-puffs cereal. Oh. my. gosh. This is the PERFECT recipe!!! I Very easy, and I love that I can just throw it in the crockpot and forget it. I can also see the potential for TONS of sweet and savory variations. I'm making a big batch to give away for Christmas. Thank you so much!!! So yummy! Just came out of the crockpot and have already eaten a couple. I'll definitely make these again! And they were so easy! I didn't have to stir and stir and stir! Also, for people who were wondering: 1 lb. of almonds is almost exactly right. I just made a batch of these with pecan halves. I picked a small one to try and as soon as I tasted it I though "oh.my.gosh." I haven't told my husband they're ready because I'm not sure I want to share. I need to bag them up for gift-giving tomorrow before I eat them all! Thanks, as always, for the great and super easy recipe. These are AMAZING! I made my first two pound batch on Friday night, only adding an extra egg white to accommodate the extra almonds. YUMMY! I'm making another two pound batch right now. One thing that I did differently was to use a gallon size Ziploc. I put in one pound of almonds and then poured the egg white/vanilla combo in and shook. Then I poured in half of the sugar/cinnamon mix and shook. I poured those into the crock pot. (I did this again to the second pound.) 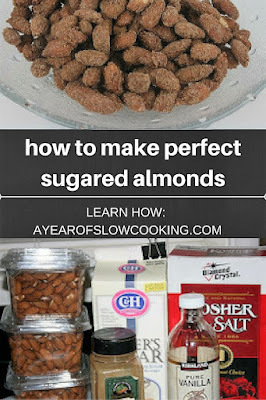 Way less mess for me, although maybe I'm the only one who had sugar and cinnamon all over the counter from the first batch and using spoons to toss the almonds. ;) I also stirred them every 30 minutes. It smells SO good in here!! Thank you for sharing this recipe (two years ago)!!! I am so glad I stumbled upon it. This is going to be a holiday repeat every year for sure. I'm a college student, and I just started using my crockpot. All your recipes are fun and easy to make, leaving me time to do what I need to do for school. Thanks so much for an awesome blog! I'm gonna make these for the neighbors along with a jar of homemade cocoa mix. Thank you for sharing your wonderful and easy recipes!